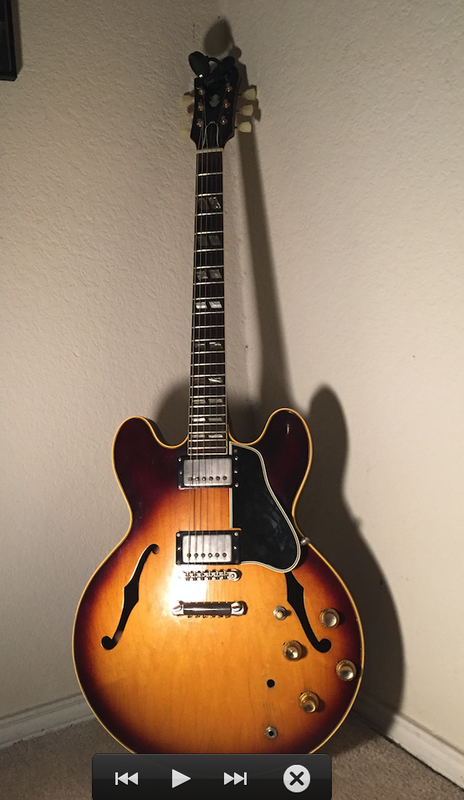 Here is my new '63 Gibson ES-345 from the glory days of Gibson. When I say glory days, I'm referring to the venerable instruments produced by Gibson during the years of 1958-1964. This one is in the top bracket of the best examples these years produced. Patent Pending pickups, 1 11/16 nut, Brazilian Rosewood Board and the old growth wood accounted with this era of fine guitars. Eric Clapton played a 1964 Cherry 335. Eric Johnson played a '62 on Tones and a '64 on Ah Via Musicom. Freddie King played a 1960 ES-345. BB Kings Lucille was a ES-345 and ES-355. This one is right with them and sounds every bit as good. It's simply a surreal experience playing a tone monster like this guitar. It's a pleasure to watch my students become inspired when they pick up this guitar. It's worth it's weight in gold.